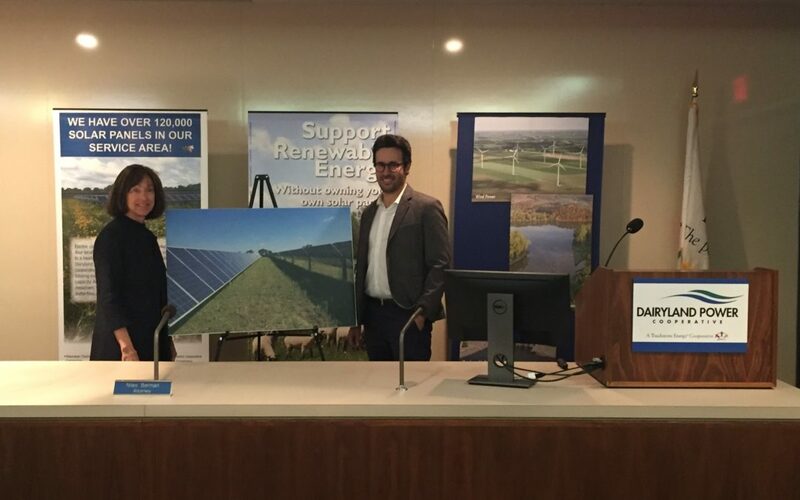 Today at their headquarters in La Crosse, Dairyland Power Cooperative announced that it will be purchasing electricity from a major new Wisconsin-based solar energy facility being developed by Ranger Power. The partnership involves a 149 megawatt solar power facility called Badger State Solar which is planned to be located in Jefferson County, Wisconsin. Ranger Power is planning to develop, own, and operate the project. Dairyland Power Cooperative will purchase all the electricity generated from the project through a long-term power purchase agreement. The project will produce enough electricity to provide the equivalent annual needs of about 20,000 homes. If all approvals are granted from local and state permitting processes, construction would begin in 2020 and operation would commence in 2022. By RENEW Wisconsin’s count, the state had about 103 megawatts of solar at year-end 2018, with Dairyland Power Cooperative responsible for about 20 megawatts, already placing it as the leader in the state for the amount of solar installed to-date. This project, along with a number of additional major solar projects, will dramatically increase the amount of solar energy produced in Wisconsin in the next five years. More information about the project is included in the links below.